Garret Van Gelder practices his science research presentation before his classmates. Garret will also present his work at the 2018 Upstate New York Regional Junior Science and Humanities Symposia in Albany. Warwick Valley High School senior Garret Van Gelder will present the results of his original scientific research, “Black-capped Chickadee Responses to Alarm Calls of Non-Flocking Heterospecifics,” at the 2018 Upstate New York Regional Junior Science and Humanities Symposia (JSHS) later this week. At the symposium, which will be held at the State University of New York at Albany March 2-8, students compete for scholarships and recognition by presenting the results of their original research before a panel of judges and an audience of their peers. Garret, along with Warwick Valley’s Jacob Gaydos, Alyssa Schaechinger, and Jack Schenkman competed last month at the Eastern New York Subregional Junior Science and Humanities Symposium. VanGelder’s presentation earned him the chance to advance to the Regional competition. Garret said a lifelong interest in wildlife inspired his topic. Presenters at Regional Junior Science and Humanities Symposia have an opportunity to win undergraduate, tuition-based scholarships and cash awards from $200 to $2,000, and the top five finalists will advance to the National JSHS. This is the first year Warwick Valley students have participated in the competition. JSHS is designed to challenge, engage, and publicly recognize students in grades 9-12 conducting research in the sciences, technology, engineering, or mathematics (STEM). 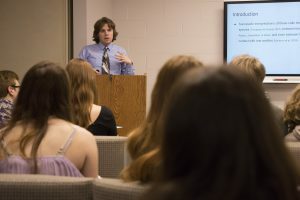 Each spring in Albany, the students from high schools across New York present the results of original scientific research before more than 500 people.